As with all military personnel it was commonplace for individuals to gain nicknames. The number and range of a person’s nicknames were directly proportional to the regard in which they were held so John Brooke-Smith must have been highest in our affections. It is interesting how perceptions of some longer-serving members of staff changed over the years as their nicknames indicate. Members of staff are listed below by name and nickname. 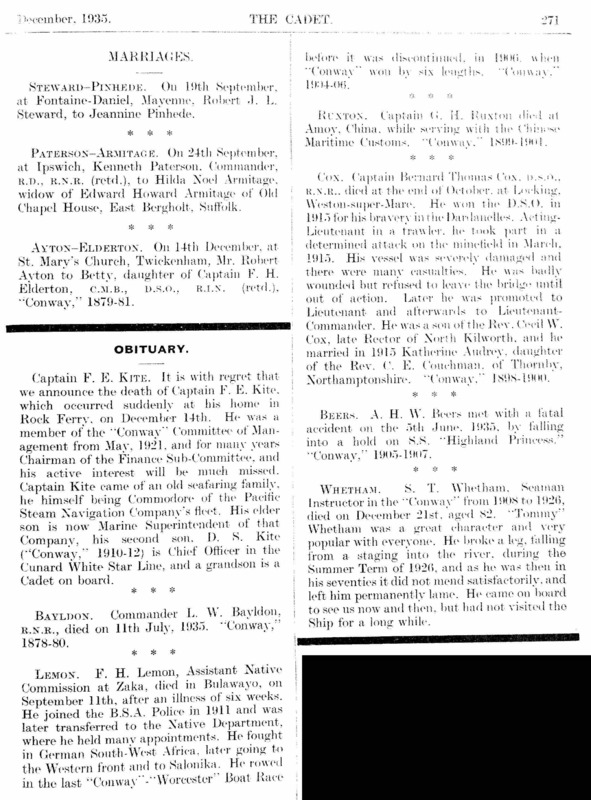 Phillip Bastow 1st Apr 1876 to 30th Sep 1879 Seamanship Instructor. Previously served in the RN from 1863 to 1876 when he paid off from HMS Liverpool and joined Conway. He was born in Buckfastleigh, Devin in 1833. Bertie see W H J Chipp. Wallace Blair, Instructor. 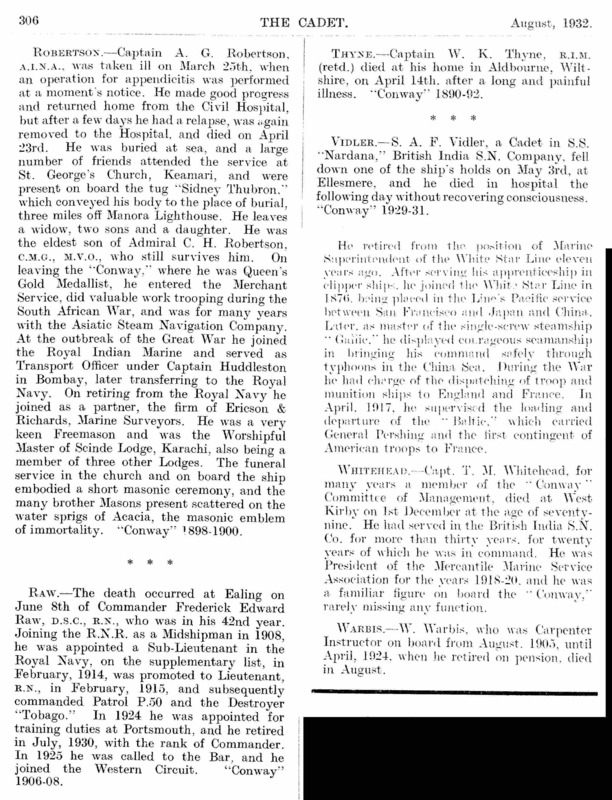 The Cadet of May 1897 (page 18) briefly reported his death. He had served in the ship for "more than 30 years" so he must have been one of the very earliest members of staff. Bluebelly see W H J Chipp. Bold, Leslie 1946 to 1957. "Chief Engineer' in the ship. IN 1946 she was moored off Bangor Pier. Leslie then travelled through to the new mooring off Plas Newydd and was aboard when she was wrecked on the Platters. After that, he remained on the staff for a further 4 years or so, maintaining the boilers that heated the huts, classrooms, etc.. 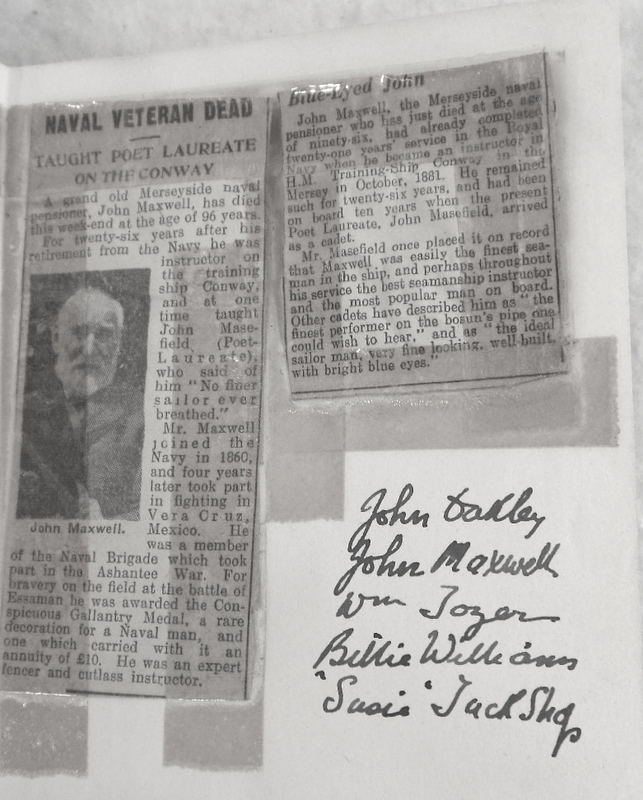 In 2010 aged 87 he donated collection of Conway artefacts to the Greenwood Centre in Gwynedd. A short profile is here. Bummy see Mr Charles Barton. Mr Burfitt Instructor in 1914. David Carroway (Spare Bags). Instructor at least 1887-9. He served in ther RN from 1856-85. He then moved up to Liverpool and became an instructor on Conway. 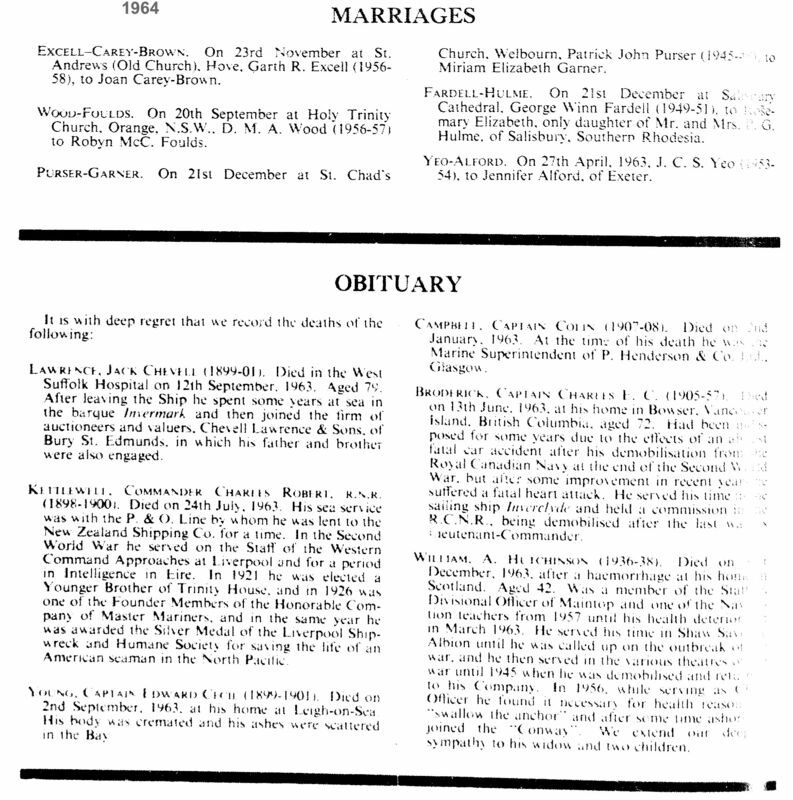 The census in 1891 show him as a naval pensioner and his wife as matron of a home for waifs and strays in Birkenhead. The 1901 census show him as "Nav Of Instructor" (Navigating Officer Instructor?). Charlie see Mr. C.T Nicholls. Charlie Nick see Mr. C.T Nicholls. Chipes see W H J Chipp. Warrent Officer Collins (Ag aka Jumper) 1937-40. Jimmy Crockett was Second Officer in the 50s. He suffered from nerves having had a bad time in the war. was "barmy" not "balmy"! He was a very nice man who was Second Officer and who suffered from a slight nervous affliction, possibly a result of wartime experience, which was sometimes evident when he took Divisions. The cadets, of course quickly latched on to this abnormality, hence the words of the alternative Conway song. Mr Davidson (25-27) (Boo Boo aka (Mighty) Mouse) Focsle's Divisional Officer in the 60s. Bill H Davies (1899-1901), Drill Instructor. Exact years not known but early 1900s. he stood ion as 2nd Officer in 1910 while the incumbent was on a course. Dhobi see Lt Cdr Clarke RN. Doggy see Wm J Tozer. Cdr G Douglas RD RNR (1893-95) (Monty) Originally joined as Second Officer in July 1907. Served as Chief Officer 1917 Sep - 1934 Sep when he retired sick. Returned from retirement around 1940 to take over from Douglas-Lane. He served his time in sail before joining Lord Line where he rose from 3rd Officer to Chief Officer. E Jarge see George Hunt. 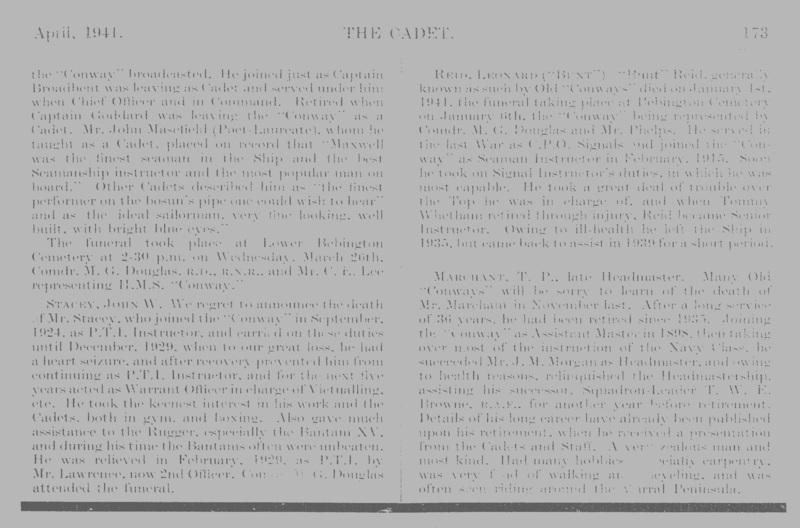 Lt H A Edwards RNR taught Navigation & Nautical Astronomy for the senior and RN class from Jan 1902 - 30th Jun1905. Left to become Marine Officer in Lagos. Flanagan was one of the two Warrent Officers. Years not known. Lt Frankyn an RNR officer on a year’s secondment in 1955. Gabby see Lt. G. A. B. King. Mr Glasspool Previously Second Officer then Chief Officer until Feb 1885 when he left to return to sea. The Gonk see D.H. Thomas. Mr Gough Instructor 1914. Killed on active service in 1916. Mr W L Graham left in 1910 but returned as a temporary 2nd Officer in 1914 to cover for a member of staff serving in the forces. Mr. Harrison (Scouse) Chief Engineer 1960 to ?? 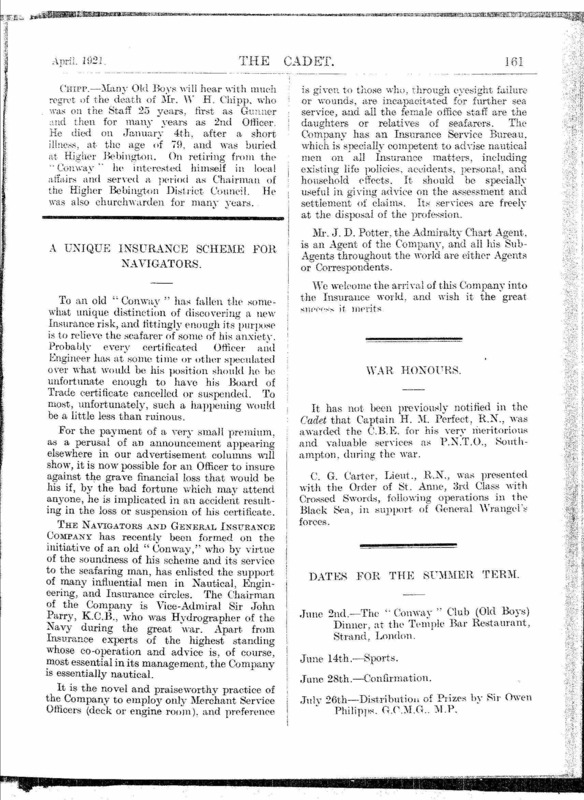 Mr Hague Mechanical Lecturer to the Navy Class joined Sep 1905. Michael Hawkins (INstructor) died 1914. 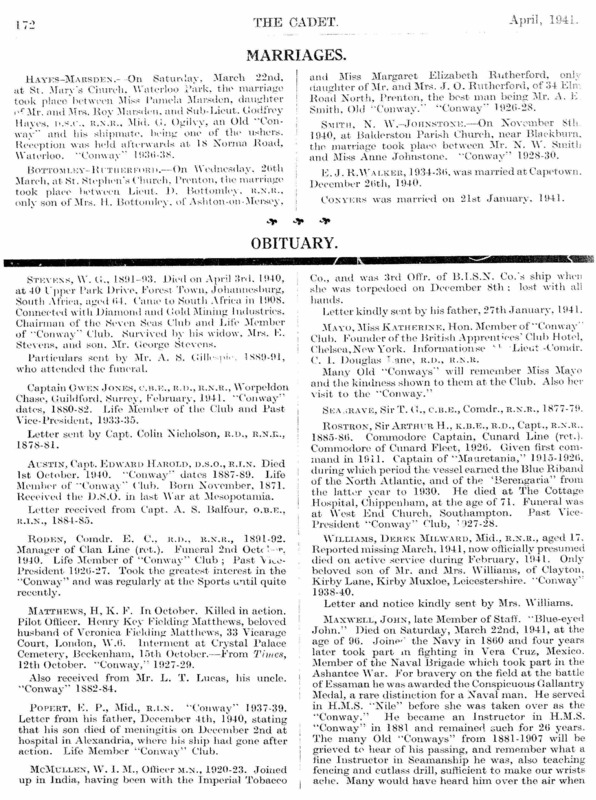 Death Notice. Mr. Hillier (Thunder Guts). Was marching instructor amongst other things 1961-3. Hoppy see Warrent Officer Lee. 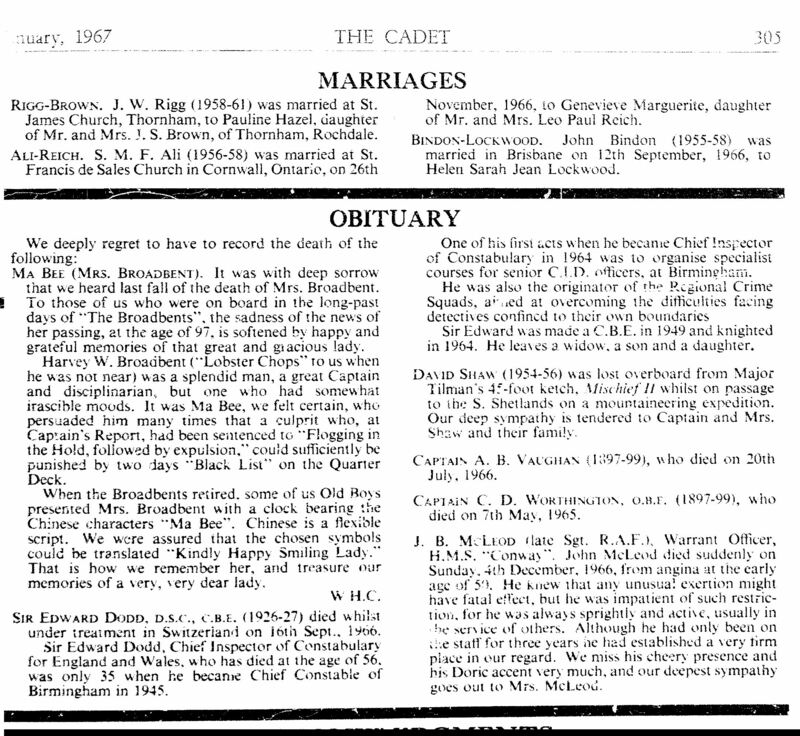 Lt Cdr Edward Howard-Davies (33-35) (Slob) Member of Technical Staff from at least 1954 to 1967. In 1960 he was Divisional Officer of Hold and Head of Sailing. He was rumoured to have been responsible for the sail design of the GP Dingy (Uffa Fix designed the hull) and owned sail number '1'. All cadet records record his name as Davies with Howard as a Christian name but as a member of staff he was always known as Howard-Davies. Mr Hunt one of the first Instructor, appointed in 1859. Mr George Hunt (The Tartar aka E Jarge) retired due to ill health in April 1916 with 36 years service he is our longest serving member of staff. He joined in March 1880 as an Instructor for many years, he became the Gunner in 1889. Until 1912 he was also the Captain's Clerk and became the fountain of knowledge about old boys. "he had a singularly kind heart and was ever a good friend to the weaker and younger boys." His father had been an Instructor in 1859. 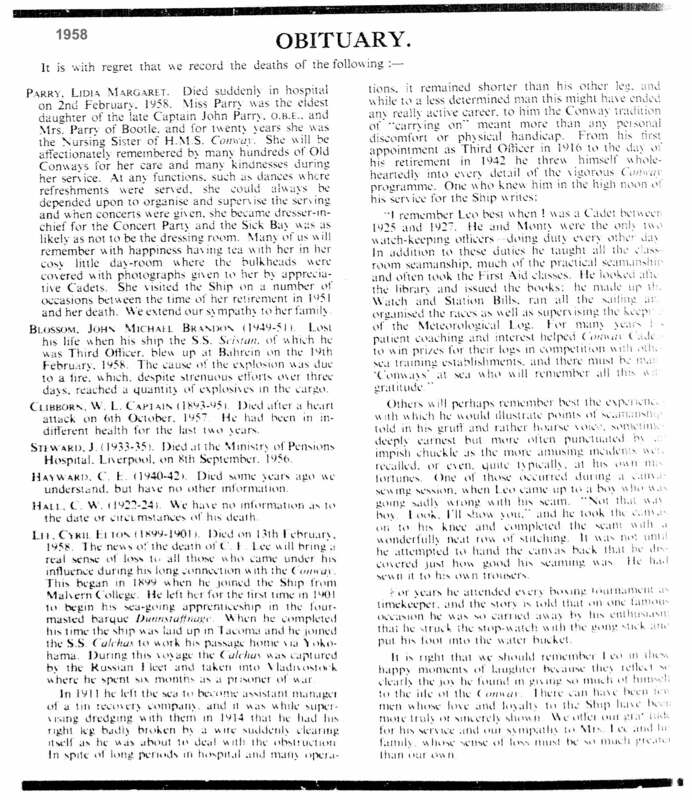 Reference to him in The Cadet 1902 Dec page 28. Moses Hunt and James Hunt were brothers - employed as seamen, they were described as “two old man of war men”. Years not known but early 1900s. Charles Ivey (Instructor/Skipper) 1887 to Oct 1904 He had charge of the steam pinnace and his watch word was "sit down in the bows". He died after tripping and falling from the Albert Pierhead - short profile here. Captain Jones OBE (Logger) 1964 - ?? A small, frail, unassuming officer, with red hair, gammy legs and a limp. San Demetrio, London tells the story of his wartime exploits and how he managed to survive in the north Atlantic after being sunk. “He drove a mini cooper with a wide bore >exhaust and after lining us up outside the Kelvin Block with our semaphore flags he would roar off to Llanfair PG for a swift one. This gave us smokers a chance to have a quick fag while he was away and the noise of the exhaust could be heard long before he returned allowing us to get back into line and carry on waving our flags about. After leaving Conway he returned to sea with Shell on their coastal tankers but his arthritis got the better of him.” He passed away in the early eighties. Lt. G. A. B. King (Gabby – because of his initials.) 1952-3. He was on loan from British Tankers and a young man not a lot older than the older cadets which meant they took to him in a special way. He used to draw the most beautiful cut-away drawings of ships. Coached the Bantam Group rugger 15. Onboard and IC Stern Party during the final transit of the ship in 1953. Lt K D Lane RIM (OC 1907-09) Joined as signal instructor 30th jan 1926. Mr V G Le Mesurier (? – 1912 - ?) Chief Engineer Instructor. Lebesque one time second officer of Comway in the early 50s. “As we left the ship for the last time in July 1951 in No 1, we all sang, 'He's my brother, Lebesque, got a row of forty medals on his chest, etc'. I think he was a temporary officer on detachment, and believe he left soon afterwards.” He was appointed salvage officer of the wreck. Warrent Officer Lee (Tooley aka Hoppy) 1941 -?? who was well liked. Tooley was an army Warrant Officer, seconded to the Conway to teach the new-fangled unarmed combat. Taught Seamanship 1940-43. Famous for pronunciation of ‘rhubarb’. Bert Mandeville officer in the initial years at Plas Newydd. Mr Marchant Joined 1899, retired Dec 1934. The Navigation Master, he was appointed a Senior Master in 1923. he trainmed some 3,000 cadets before rteiring to a "well earned rest". He trained at the Royal Observatory, Greenwich. Lt H McNelle Dibb RNR (Feb 1883-Dec 1884). He was CPO in his last term. 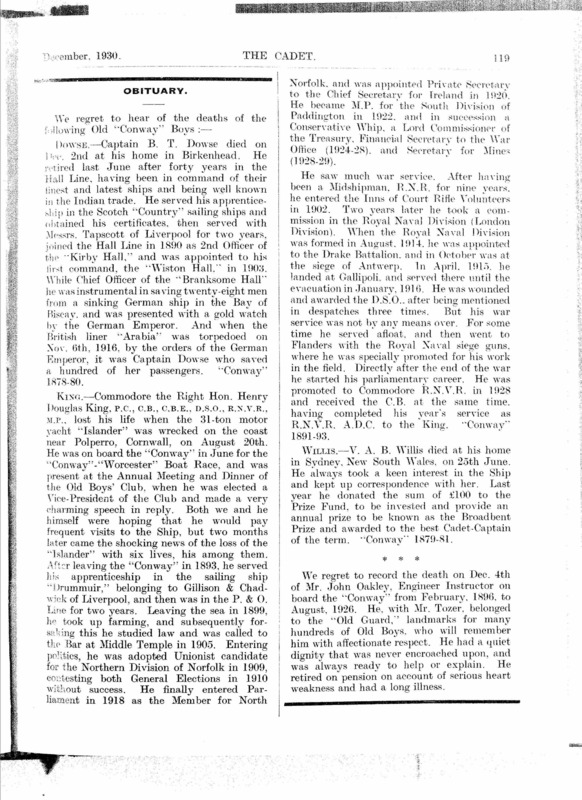 He joined Abram Lyle & Sons and rose to First Officer with the White Star Line.For three years prior to rejoining Conway he had been Chief Officer in Beaver Line. On appointment he asked for the defaulters list to be cleared so that "all might start fair". John Milson left 1907. "A grand olf man, fine seaman and well natured". Which rarely used to go. Ocka Jock see Mr McLeod. Lt. J. Oliver (Taffy) A much liked Petty Officer during the 1950s. In 1960 was divisional officer for Foretop and Maintop in the House. Taught Signals and Seamanship. “Taught me all I knew about sailing. Sometimes was called “Way Ho – Jay Ho” with all the sing song of the Welsh accent. When he wanted to locate some cadet on board he used to hail down the main hatch, “ Way Ho – Smith or whatever” whereupon the whole ship would shout back, “Way Ho – Jay Ho!” John Oliver was the quietest of the three POs. His lilting Welsh accent was always controlled and he never seemed to have to raise his voice much at all. For a couple of terms he was my divisional officer and I found him to be very considerate and thoughtful. The other thing that I remember about him was that his initials JO, and the way he wrote them, were extremely easy to forge. This was a great benefit when one needed a note or a textbook label initialised by your divisional officer. Something I took advantage of on a couple of occasions.” In the last ten years of his life he ran the cafe at PD. Mr. A.R. Ollerton (Ollie) in 1960 was Focsle divisional officer. He always wore a real flat as a plate white cap which looked too big for his thin face and head. Link here. T Harry Owen RN Instructor at least April 1893. 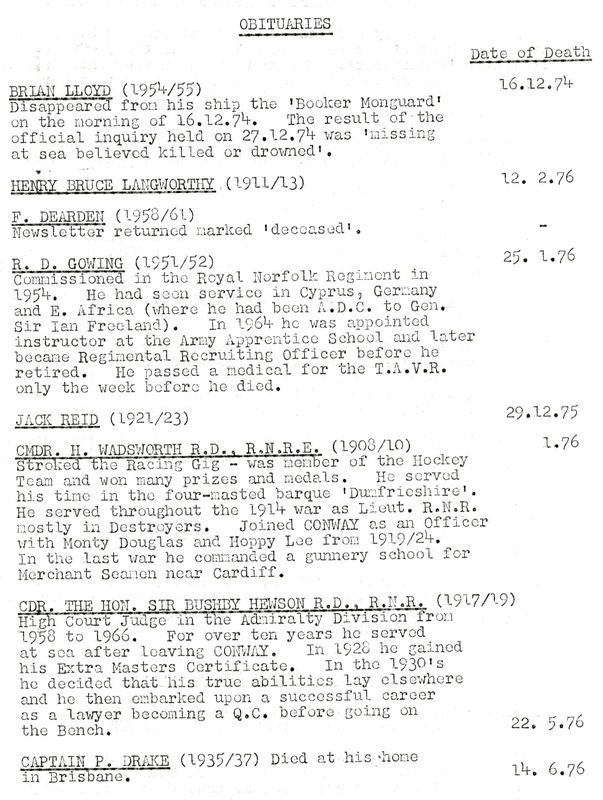 Lt. Parry (Reg aka Wah Wah) (42-44) Was Foretop divisional officer from at least 1956 to 1970 when he went back to sea. Mr Patterson employed as a temporary Engineering Instructor in 1914 to cover for a member of staff serving in the forces. Warrent Officer Jack L Phelps (Bossie) 1943-5. A cockney whose family were Thames watermen for generations. He was a holder of Do0ggetts Coat & Badge. William Potter (Quack aka Quacko) Master at Arms 1859/60ish to at least 1894. Tom Priestley Instructor late 1880s/90s. Lt. Skinner RN (Winkle aka Charlie) 1950s. Known originally as Charlie but renamed “Winkle” after the loss of the ship. “When we salvaged the sea chests from on board we had to empty them and hose them out. ‘Get ‘em good and clean. We don’t want to find no winkles in there.’ ” He was the PTI and would also cut hair on Saturday morning for a bob! “He had a cheerful sadistic streak using the tannoy, ‘Wakey, wakey, rise and shine, middle of the day and the sun's burning your bleeding eyes out!’ This at Zero Crack Sparrow Fart on a January morning with the horizontal sleet coming down the Straits and we had to do the morning run from the House up to the Figurehead before having a shower!” Was serving in Ark Royal when she was sunk in November 1941 while accompanying a Malta convoy. 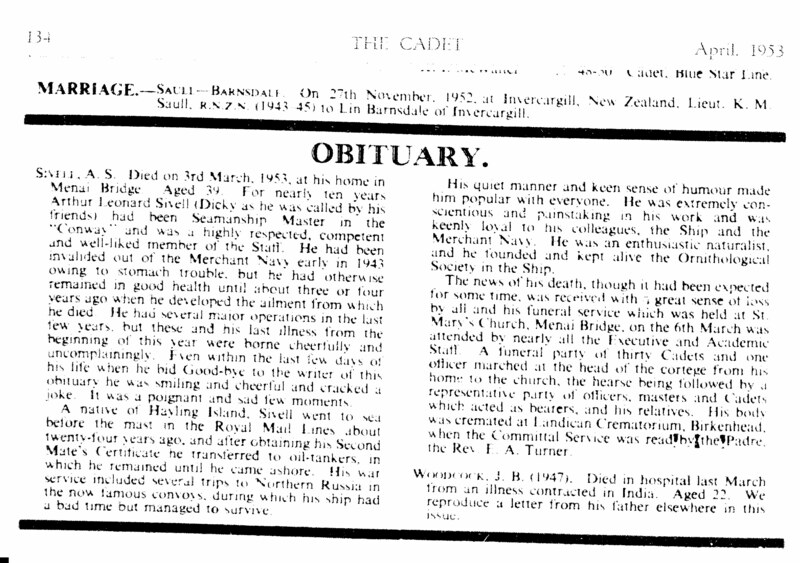 Took cadets for gymnastics but died quite suddenly in 1959. Slob see Lt Cdr Howard-Davies. D H Thomas (The Gonk – he was a short, round man with a dark beard so he quickly gained the name of the 60’s children’s TV characters) joined around 1964-5. He had the unnerving habit of bursting into Senior Cadet Captain's cabins, without knocking, on his duty day. This was until the senior rate of Foretop devised the "Anti-Gonk Device". This was simply reversing the door hands to 'Lift to Open'. The device did not stop his unannounced invasions but by frequently reversing the door handles at least it gave us a 50/50 chance of defeating the incursions.” “I remember he suffered from chronic dandruff and his uniforms always seemed ill-fitting. He was a terror for ensuring we were always smartly turned out!” A small knitted and well stuffed gonk became the 1st XVs mascot. Mr Howell Thomas Mathematics master at least Autumn term 1920. Oswald Tuck was born in 1876. He was educated at Greenwich Hospital School. 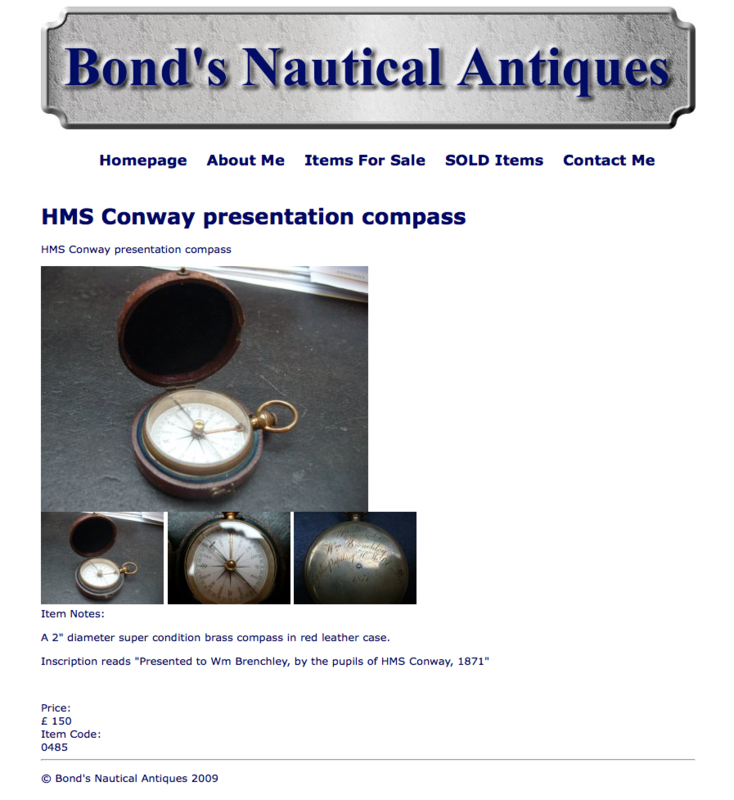 In 1896 he joined Conway to teach astronomy and navigation with the title Naval Instructor. He left in 1899. His Conway diary for January 1898-August 1898 is held in the Churchill Archive Centre. Wah Wah see Lt. Parry. Wally an instructor from at least 1877 he died onboard on May 11th 1897. Capt JD Weir taught navigation and seamanship. He returned to sea in 1947. William Warbis Sep 1905 joined as Carpenter Instructor from Price’s Candle Works. Left in July 1905 to join Messrs Morgan and Blakeman. Tommy Wetham Instructor years not known. Williams, Instructor joined Sep 1904. His "former experience in the RN has given to the ship an expert instructor in that increasingly imoprtant subject signalling, in its various branches".